Now that more and more people are waking up to Obama and “Tea Party’s” are breaking out all across the country, Lloyd Marcus has written and performs an “Anthem” for us all. Go here to join in the 24 blog: www.JackBauertotheRescue.blogspot.com. We’ve been telling conservatives how important the upcoming Special Election in New York that represents our first step towards taking away the majority that Obama/Pelosi/Reid currently enjoy. The Democratic Party leaders are well aware of the importance of the race. Barack Obama’s advisors are now steering the campaign of the liberal Democrat candidate. Bill Clinton was sent in to do a $10,000 a plate fundraiser. And Nancy Pelosi has sent in her top deputy to the district to try to win this race. This seat was held by a Democrat – and so if we can win, and defeat their new Democratic candidate (liberal Scott Murphy) then it will be a net gain for the Republicans and a loss for Pelosi’s Democrats. It would be a profound rejection of the recent policies of Barack Obama and the Democratic Congress. You’re Not So Smart Without Your Teleprompter, Now, Are Ya? 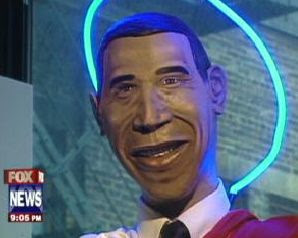 Thanks to alert 5th Listener for pointing out this Reuters photo of Obama as Jesus. I’ll add it to my collection. That’s a real art project over there.And look down there. 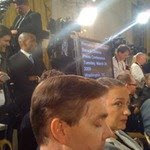 There’s Obama’s teleprompter at tonight’s news conference. Mooooooooom! He Breathed on Me! Can We Sue Him? EPA Wants to Label C02 as "Dangerous"
The EPA is considering declaring C02 a “dangerous” gas. …the agency earlier this month proposed a national system for reporting carbon-dioxide and other greenhouse-gas emissions by major emitters. The EPA has said about 13,000 facilities, accounting for about 85% to 90% of greenhouse gases emitted in the U.S., would be covered under the proposal. According to the US Chamber of Commerce, regulating carbon through the Clean Air Act would affect at least one million mid-sized commercial buildings, including: 1/5 of all food service businesses, 1/3 of all health care businesses, 1/2 of the entire lodging industry, and even 10% of all buildings used for worship. The Heritage Foundation’s Center for Data Analysis has estimated that EPA carbon regulations will cause annual job losses exceeding 800,000 for several years and a cumulative GDP loss of $7 trillion by 2029. In actuality, the Obama Administration has no desire to regulate carbon through the EPA. They are only using the EPA as the threatening tool to force cap and trade legislation through Congress; legislation that President Obama even admitted would cause American’s power bills to “skyrocket“, would do nothing to stop global warming, and, if part of an international treaty, would send American tax dollars to foreign millionaires. Seriously? This is an actual product. The one just up there is his “Determined” look. The one below is the “Happy” look. If You Lose Your Economic Freedom, You Lose Your Freedom. Period. But, you know, if you lose your economic [freedom], you lose your political freedom, all freedom. Freedom is something that cannot be passed on in the blood stream, or genetically. And it’s never more than one generation away from extinction. Every generation has to learn how to protect and defend it, or it’s gone and gone for a long, long time. Already, many of us, particularly those in business and industry, there are too many who have switched rather than fight. And it’s time that particularly, some of our corporations learned, that when you get in bed with government, you’re going to get more than a good night’s sleep. 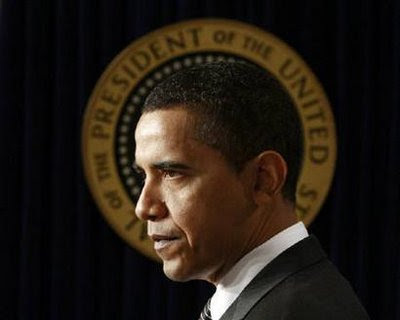 President Barack Obama has repeatedly claimed that his budget would cut the deficit by half by the end of his term. 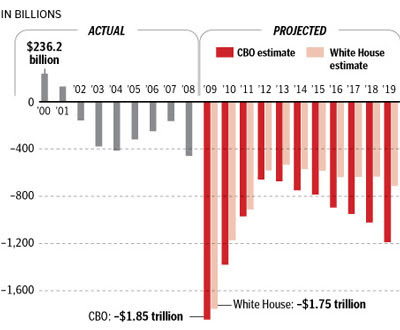 But as Heritage analyst Brian Riedl has pointed out, given that Obama has already helped quadruple the deficit with his stimulus package, pledging to halve it by 2013 is hardly ambitious. More here. Read this. Scary.